Siege the Night with the power of light! Join us as we celebrate Chanukah with the Tampa Bay Buccaneers! Start the celebration with an exclusive pregame giant Menorah lighting at 11 AM, featuring special guest, Buccaneers Co-Chairman Bryan Galzer. A special tailgate will follow, located at the Veranda C, complete with delicious Latkes, doughnuts & dessert. Plus! Jam along with your favorite Chanukah tunes as you enjoy a top shelf bar! 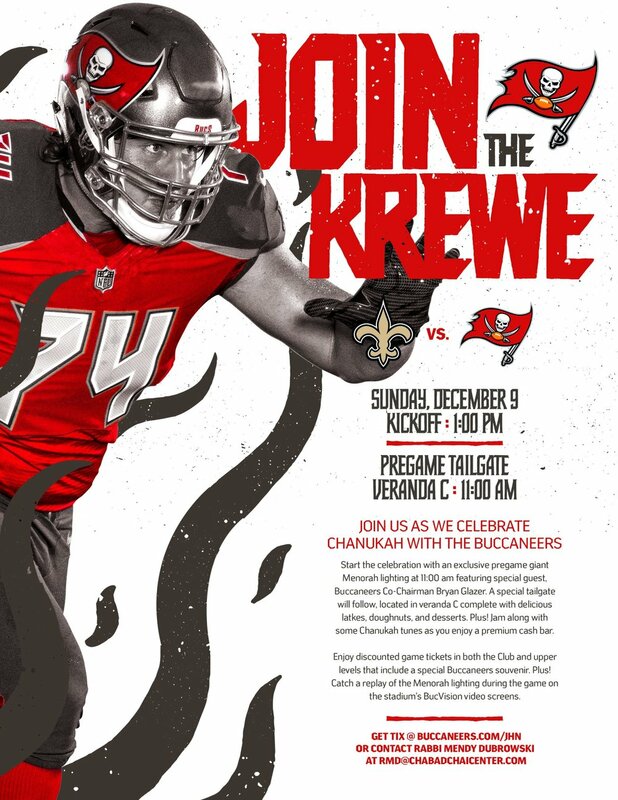 Enjoy discounted game tickets in both the Club and upper levels that include a special Buccaneers souvenir. Plus! Catch a replay of of the Menorah Lighting during the game on the Stadium's GIANT BucVision video screens!